I love designing small, narrow gardens. The narrower the better and it does not hurt if the garden is south facing, creating warm areas from dusk till dawn. The narrow row house garden exists in almost every country and for those who want to make the most of them, there are endless possibilities. One of the luxuries when designing a small garden is that there doesn’t have to be any left over space. Larger gardens often have a north or east side of the house which will never have any major function and thus just have to be finished, either with a low budget lawn or an expensive make over for a space that no one uses. In the small and narrow row house garden every space can be put to a functional use. 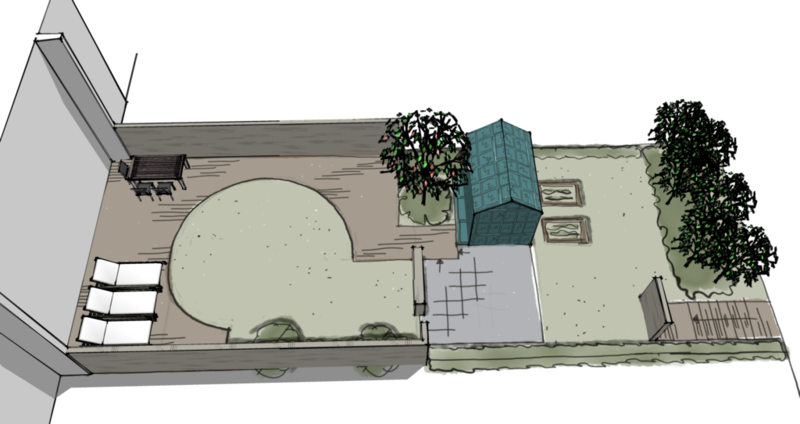 The following sketches show 4 overviews of four options for this row house garden in Reykjavik. In this first option the decking closest to the house is semi-enclosed with high walls to the sides. Partitioning the main deck from the rest of the garden with a custom made grilling station and a raised herb garden creates a semi-private space. From the opening of the deck lies a path of stones cutting through the lawn and leading to a modern style sculpture. The sculpture can also be viewed from the hot tub. The hot tub is positioned so that it catches the last of the suns rays in the evening as well as through most of the day. There is also a paved area with an extra large set of sofas for those much-needed moments of relaxation. This is a must for parents of always-tired teenagers. 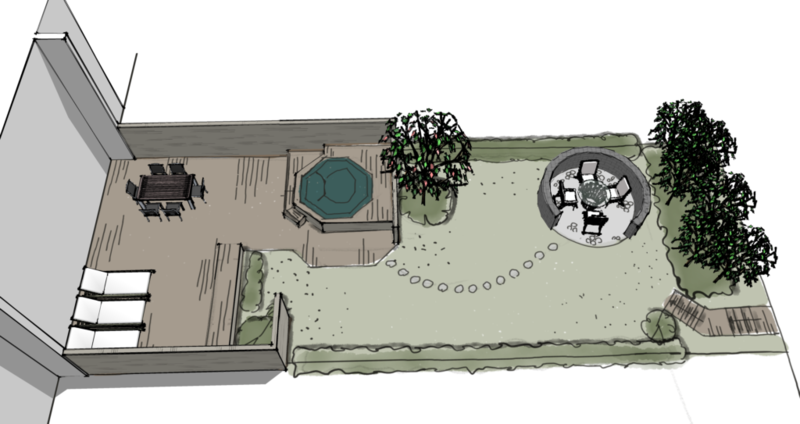 In this option the decking surrounds a circular lawn with areas adequate for lounging in three corners. Each of the corners catches the sun’s rays at different times of the day making sunny autumn days a real treat. The greenhouse divides the garden into two main areas, one for relaxation and the other for more arduous tasks such as growing vegetables. In the third option the west facing wall is the high function area making this garden a treat for B type personalities. This is also a great option for those who like to cook outdoors all year round with its’ sheltered grill area. In colder climates it might be tempting to fix an outdoor heater to the inside of the grill shelter roof. 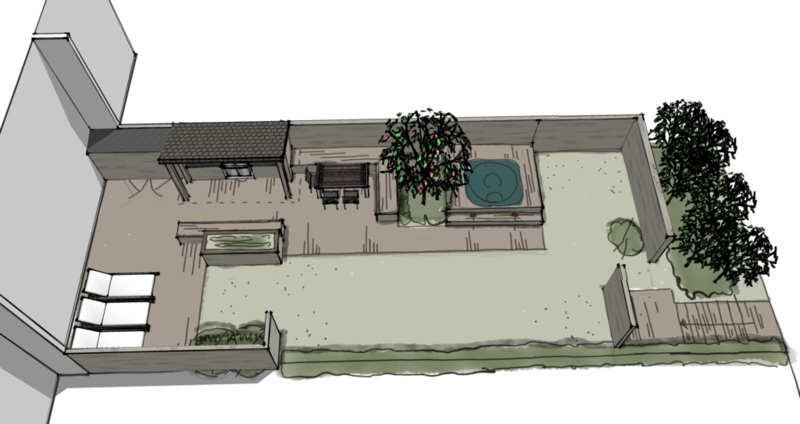 This option also includes a small storage shed and a hot tub and the compulsory raised herb garden. The elongated lawn is perfect for all sorts of outdoor games like croquet or the Scandinavian “Kubb”. And last but not least an option with a large hot tub, for 8-10 people, an evening stone plaza, stepping stones in the grass and shapes that contrast the square building. 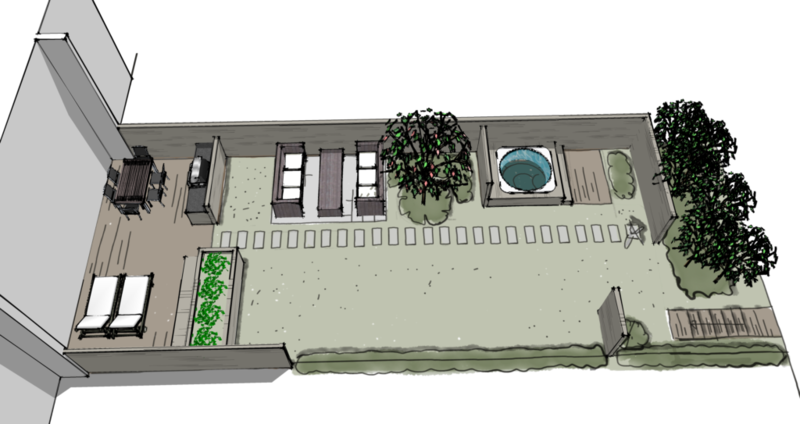 With the hot tub as a centrepiece the forms are simple yet varied and the whole garden functions like a small open plan apartment with open connections allowing an easy flow from one area to another. These designs are all for the same garden. It is designed at a time when at last my old dream is coming true. After testing and trying different methods for two decades I can at last include three dimensional sketches of all my designs at an affordable price. The preliminary sketches are drawn on an iPad pro, with an apple pencil, using the app Paper 53. I then import the plan into Sketchup Pro along with textures also done in Paper 53. Using the “jitter” option in Sketchup the drawings get that hand drawn feel.